The heart, one of the vital organs in the human body, is a powerful pump located behind and slightly to the left of the breastbone and between the lungs. It is a muscle about the size of your fist which contracts and expands using its own bio-electrical system, to continuously pump blood ar ound the body to nourish and provide energy. The pumping of the heart is known as the cardiac cycle, which occurs about 72 times per minute and it pumps blood through network of vessels in the body. The heart lies at the centre of these complicated network of blood vessels which include arteries and veins. The left side of the heart receives oxygen filled blood from the lungs and pumps it out through the 'arteries' around the body and the right side receives used up-blood containing carbon dioxide through the 'veins' and sends this blood to the lungs to get rid of the carbon dioxide and take in fresh oxygen. The heart, in the simplest terms, consists of four chambers, two atria (upper chambers) and two ventricles (lower chambers). As the muscles of the heart relax, blood (oxygen filled blood from the lungs and carbon dioxide filled blood from the rest of the body) enters its various chambers. The atrium fill with blood and help move blood into the ventricle. 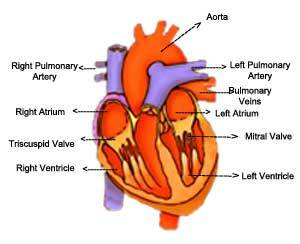 The ventricle supplies the main force that pumps the blood out, through either the lungs or to the rest of the body. As the blood enters the heart, Flaps called valves close quickly to stop any blood leaking backwards and thus control the direction of blood flow. There are four valves; mitral and the tricuspid between the atria and the ventricles and other two, aortic and pulmonary through which blood enters and leaves the heart. • Arteriosclerosis (hardening / clogging of the arteries due to excessive build up of fat and cholesterol known as plaque). Fatty plaque deposits inside the blood vessels cause it to narrow and can totally block blood vessels and also cause the valves that control the direction of blood flow to thicken and become stiff. Arteriosclerosis in turn is the underlying cause of most cardio vascular diseases. • The heart has to work harder due to decreased blood supply. Greater force is necessary to push blood through narrowed vessels due to plaque build up. So high blood pressure develops and this buildup and shortage of oxygenated blood over time, leads to heart attacks. In a heart attack, a part of the heart muscle becomes starved for oxygen and dies. • Angina (chest pain caused by temporarily reduced oxygenated blood flow to the heart muscle), causing pain in the chest, in the left arm or between the shoulder blades. • Dissecting Aneurysm: The atherosclerosed aorta becomes brittle and can break much easier creating a life threatening situation. • Heart failure is very common in the elderly. In people older than 75, heart failure occurs 10 times more often than in younger adults. • Abnormal heart rhythms (arrhythmias) of various types. From forty through seventy, the five major risk factors for heart disease are family history, smoking, high cholesterol, diabetes and high blood pressure. But apart from family history and smoking, the others are related to diet, weight and inactivity. Directly, age is not a risk factor but people tend to put on weight and become more inactive as they age and a combination of other factors like continuing heart-unhealthy habits and diets takes its toll as people age and as such age is a risk factor for the other risk factors. Apart from cholesterol; stress and the presence of Lp (a), a lipoprotein; homocysteine, an obscure amino acid ; and triglycerides, a compound of fats in the blood are also involved in the development of heart diseases. Your triglyceride levels tend to rise from forties through sixties. The higher the levels of triglycerides, the higher the probability of reduced levels of good cholesterol (HDL). The body also converts the cellular carriers of triglycerides into forms of bad cholesterol (LDL). Risk factors that you have some control over include high blood pressure, cholesterol levels, diabetes, obesity, and smoking. 'Atherosclerosis' once thought to be an aging disorder is now known to be a progressive narrowing of arteries over time which is fed by rich diets, high in cholesterol and fats and aggravated by smoking and high blood pressure. People who work out seriously and continuously for most of a decade has been seen to cut their age related decline of maximal heart rate in half. So maintaining a healthy diet and regular activity level and stopping unhealthy habits like smoking go a long way in controlling heart related problems. Age 35 is a good time to get your blood checked out, especially your cholesterol levels ( a base level blood count and a full lipid profile) and blood pressure, and have a follow up every other year. Consider getting a CT scan at 40, if there is a strong incidence of heart disease or heart attack in your family. People aged 30 and older, who are more prone for a heart disease risk, like people having a sudden new pain, and those who are smokers and have a family history of diabetes or have diabetes should have a baseline ECG Test . 50 to 60% of your total calories should come from carbohydrates such as rice, bread, potatoes and pasta. Limit the cholesterol in your diet to 300milligrams or less, a day. Eggs, meat and diary products are major sources of cholesterol. One egg yolk contains about 220 milligrams of choleterol. Moderate exercise is one of the best things you can do to keep your heart and the rest of your body, healthy. Consult with your health provider before beginning a new exercise program. Exercise moderately and within your capabilities, but do it regularly. Exercise helps reduce stress and prevent obesity which in turn is associated with the development of heart disease, diabetes etc. It also helps people with diabetes control their blood sugar.